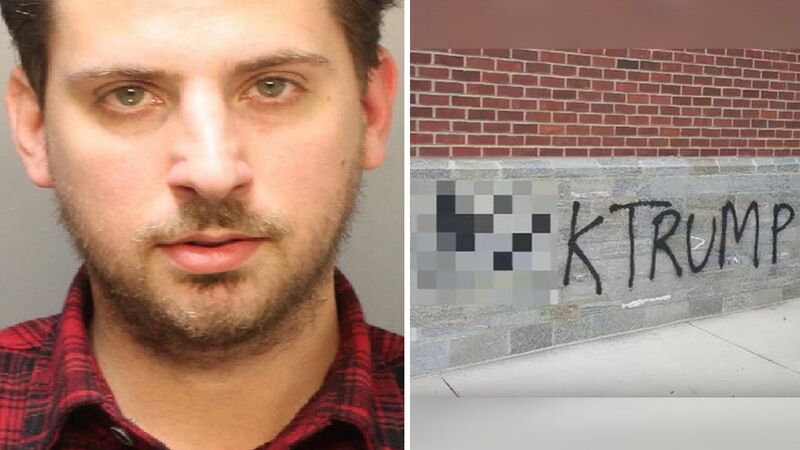 PHILADELPHIA, Pennsylvania -- A man from Brooklyn has been charged in connection to a vandalism incident at a market in Philadelphia. Evan Brown, 33, was arrested Sunday on West Southampton Street in Philadelphia and charged with criminal mischief and related offenses. Police said Brown was seen on surveillance video on November 25 spray-painting anti-Donald Trump graffiti on the Fresh Market building in the Chestnut Hill neighborhood. The messages painted include "F--- Trump." Police said a second suspect, identified as assistant city solicitor Duncan Lloyd, was seen on surveillance, dressed in a blue blazer and holding a glass of wine, taking pictures or video of the graffiti. Both Brown and Lloyd then walked away from the area. Police estimated the damage to the building at $3,000 to $10,000 due to the composition of the stone used during the construction of the facade. Lloyd will not face charges. It was announced last week that police didn't submit a warrant requesting charges against the attorney. The assistant city solicitor has been on a two-week leave without pay, but because of his "inappropriate" actions has also been ordered to complete 40 hours of community service with the city's Community Life Improvement Program, working with its Graffiti Abatement Team, First Deputy City Solicitor Craig Straw said in a statement last week. The city's inspector general, Amy Kurland, said she was "comfortable" with the handling of the case. She said "punitive measures of unpaid leave and community service" were appropriate and "are consistent with the discipline imposed on city workers who have engaged in comparable examples of conduct."